‘Vengeance on Varos’ is an unreserved highlight of Colin Baker’s first full year as the Sixth Doctor, employing the usual decree for violence and power struggles but managing to explore these issues with a degree of finesse rarely obtained in this era. 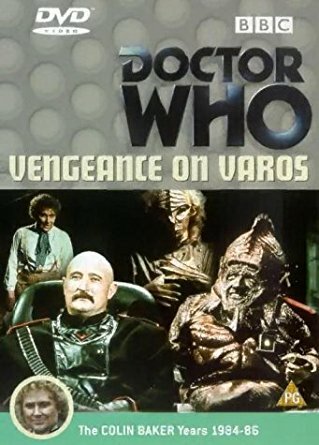 Indeed, as a satirical indictment against the violent trends of civilization as well as of reality television that has become so popular and pervasive in the decades since its airing, ‘Vengeance on Varos’ remains incredibly relevant and withstands the test of time immeasurably well. Of course, Doctor Who is by no means alone in predicting the rise of so-called reality television, violence and fights for survival played out in front of a watching audience the basis of many works of science fiction at the time and to this day. Nonetheless, it’s intriguing to note that it aired at a time when The House of Lords began making acts of democracy public by broadcasting debates as well as when laws about videos were changing and the BBC was experimenting with interactivity in homes. These elements all focus, and the recordings within Varos’s Punishment Dome are clearly being used as much for profit as for supposed public education. However, ‘Vengeance on Varos’ is also incredibly self-aware about it being violent television about violent television, and the governor’s directing and torture devices that make fearful images real successfully blur the line between fact and fiction to given context to the madness around them. One of the biggest issues with this era of Doctor Who is that it often uses violence simply to use violence, Peri in particular suffering in many instances from this focus on torment and torture. However, ‘Vengeance on Varos’ is willing to also discuss the violence it shows within a society where brutality is so innate to its daily being. Suddenly, rather than Doctor Who using random and empty violence to propel its plot, it instead acts as a channel for debate about a corrupt government using threats of violence to control its populace and the corrupt general populace being complicit in the violence at least to some extent. It’s a subtle shift in the dynamic, but it puts the violence into context and, indeed, proves to be vital to the very foundation of this serial, hearkening back to the much-loved darker period of early Fourth Doctor era while also calling into question the quality of the stories around this one. One of the more fascinating subplots of ‘Vengeance on Varos’ is the governor and his absolute need to maintain public approval in order to keep his position and his life. It goes without saying that this is a fundamentally flawed system that could never allow for any meaningful change, but it also exaggeratedly addresses the inherent flaw in any democratic system while instilling a sense of empathy to a man literally trapped by the status quo. The suggestion that a man who fears for his life will be spurred to find solutions to better society has merit in some regard, but change of any sort is rarely a popular proposition, restricting what can realistically be achieved when such mortal consequences for failure are made so abundantly clear. The Colin Baker era struggled with presenting its flawed Doctor in a positive light, too often emphasizing egregiously questionable attributes while sacrificing the potential for meaningful character growth. While he does not undergo any sort of transformative change here, he is at least able to make a meaningful change and bring the potential of peace to Varos, though interestingly he leaves the population to their own devices to follow through with this potential after spending so long criticizing that same population. Nevertheless, as a whole, ‘Vengeance on Varos’ is a great piece of television that works on nearly every level and highlights the true potential of this era.